What are the sources of fine particulate matter? PM2.5 material is primarily formed from chemical reactions in the atmosphere and through fuel combustion (e.g., motor vehicles, power generation, industrial facilities, residential fire places, wood stoves and agricultural burning). Significant amounts of PM2.5 are carried into Ontario from the U.S. During periods of widespread elevated levels of fine particulate matter, it is estimated that more than 50% of Ontario's PM2.5 comes from the U.S. 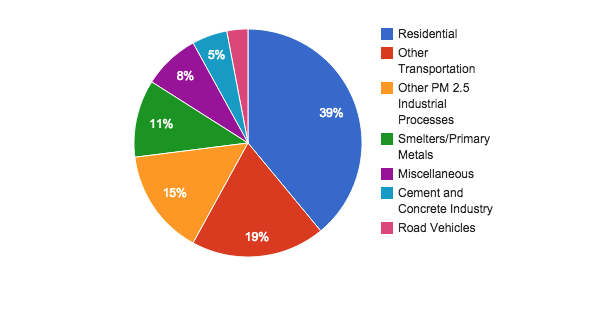 Approximately 39% and 22% of PM2.5 emitted in Ontario in 2012 came from residential and transportation sectors, respectively, while other PM2.5 industrial processes accounted for 15%. Lesser sources of PM2.5 include smelters/primary metals, miscellaneous, and cement and concrete industry. The greatest effect on health is from particles 2.5 microns or less in diameter. Exposure to fine particulate matter has been associated with hospital admissions and several serious health effects, including premature death. People with asthma, cardiovascular or lung disease, as well as children and elderly people, are considered to be the most sensitive to the effects of fine particulate matter. Adverse health effects have been associated with exposure to PM2.5 over both short periods (such as a day) and longer periods (a year or more). Fine particulate matter is also responsible for environmental effects such as corrosion, soiling, damage to vegetation and reduced visibility.